First settled under the name of Pejepscot in 1786, Auburn, Maine is the county seat of Androscoggin County and was the first Maine city to use a council-manager form of government. The town name of Auburn was inspired by a poem by Oliver Goldsmith titled ‘The Deserted Village’. Auburn neighborhoods and villages include Auburn Plains, Danville, East Auburn, Littlefield Corner, Marston Corner, New Auburn, North Auburn, Stevens Mill, and West Auburn. After the arrival of the railroad and the construction of a bridge to Lewiston in 1848, Auburn became a booming mill town that manufactured shoes, cotton and wool textiles, bricks, furniture, and ironworks. Auburn has its’ own ski area, Lost Valley, open for outdoor adventure sports year round. Famous residents of Auburn have included skiers John Bower and Julie Parisien, jazz guitarist Lenny Breau, botanist Elmer D. Merrill and geologist George P. Merrill. 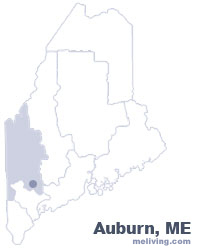 To share any Auburn, Maine information with us, please contact us. Learn more about advertising in MELiving. The City Clerk’s office records and maintains all vital statistic records relating to births, marriage, and deaths, conducts elections and voter registration, is responsible for the issuance of business and marriage licenses and is responsible for maintaining City records including City Council agenda’s and minutes.